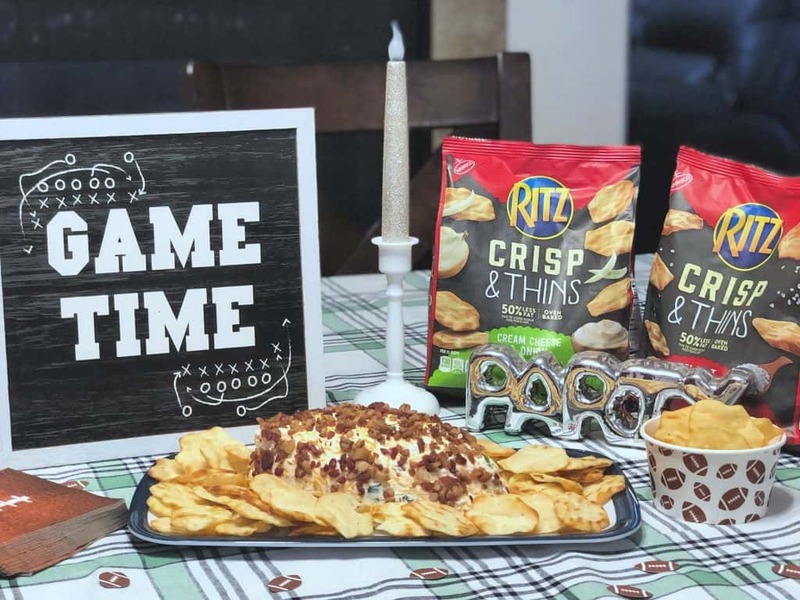 The big game is this Sunday and I was inspired to create this incredible Jalapeño Popper Cheese Ball and pair with RITZ Crisp & Thins. Grab the recipe below! In our home, if it is football season, the games are on. My husband is a huge football fan and watches every single football game. In fact, we basically have cable because the man needs the football channel. With the big game coming up this Sunday and one my husbands favorite teams in the game, we are prepping for some fun and hopefully a win! I am all about having easy food to snack on through the game, but I also love a good theme. 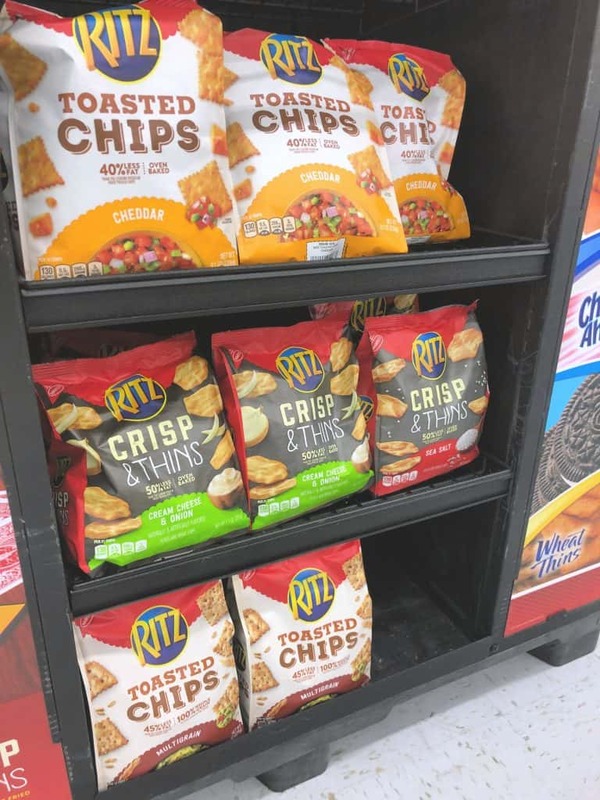 I was passing by this cute display in Walmart the other day and saw the RITZ Crisp & Thins in cream cheese and onion and immediately had a grand idea! 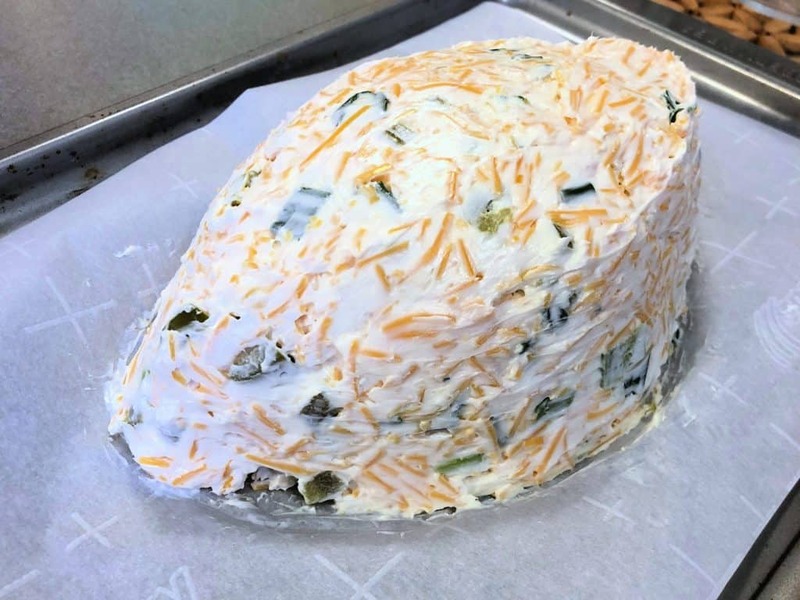 I was going to make a super tasty jalapeño popper cheese ball. 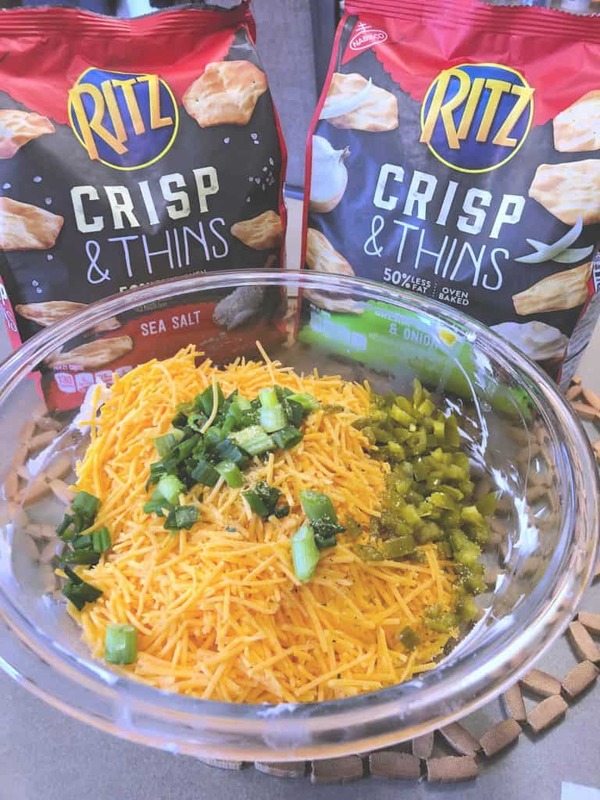 I grabbed 2 bags of RITZ Crisp & Thins and the rest of my ingredients and took off to create a tasty dish for the big game! We like things a bit spicy in Colorado, so naturally this jalapeño popper cheese ball was an easy choice. Cream cheese, sharp cheddar, jalapeños, green onions, garlic powder and some bacon made this a delightfully easy snack and I know it will be a huge hit come Sunday’s big game. Simply soften the cream cheese and then add in the sharp cheddar, diced jalapeños, green onions and garlic powder. Then mix it all together. I used a spatula to do the mixing which seemed to work better than a spoon. I also made sure that my cream cheese was VERY soft. Once the mixture was ready, I placed the cheese mixture on some parchment paper and used the spatula to shape it into a football. It wasn’t perfect, but it was actually really easy to make the shape. Once I had the shape, I placed it in the freezer for about 15 minutes to help it hold its shape better. Finally I added the bacon bits to the outside of the jalapeño popper cheese ball. 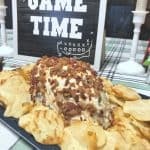 It was incredibly easy to make and when we took a bite to sample the recipe and decide if we were going to serve it on Sunday or not, my husband and I both looked at each other with serious cheese ball love! You guys, this is THE appetizer to serve at your big game party! To make everyone’s life easier, the printable recipe is below. 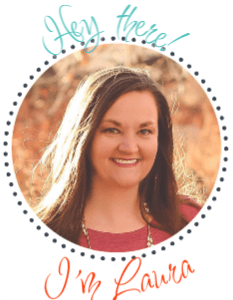 It includes the ingredient list for easy shopping and amounts of items to use. Make sure to purchase the RITZ Crisp & Thins to pair with this jalapeño popper cheese ball. It brings a great crunch to this already amazing dish! 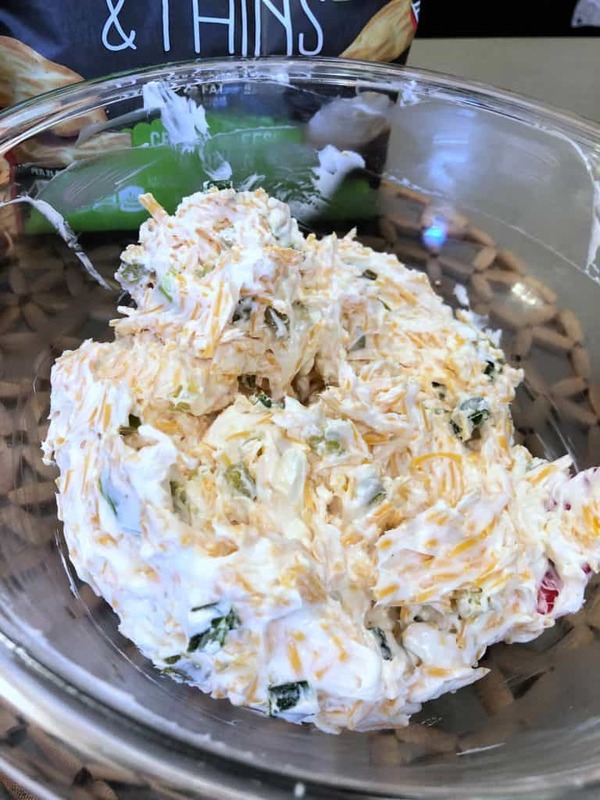 A perfect pairing of cream cheese and jalapeños in a dippable dish, perfect for your big game celebrations! 2. Mix in the jalapeños, sharp cheddar cheese, green onions and garlic powder into the cream cheese. 3. Shape into a football on parchment paper or a flat dish and place in fridge to firm up. 5. Place on a serving dish and surround the cheese ball with RITZ Crisp & Thins and serve! This entire recipe was inspired by RITZ Crisp & Thins. I saw the Cream Cheese & Onion flavor and immediately knew that I was going to make the jalapeño popper cheese ball. They are thin, crunchy bits of buttery goodness, oven-baked to perfection and pair perfectly with the cheese ball. Use a cheese knife to cut a part of the cheese ball and then place it on the RITZ Crisp & Thins for the best thing you will taste this year! 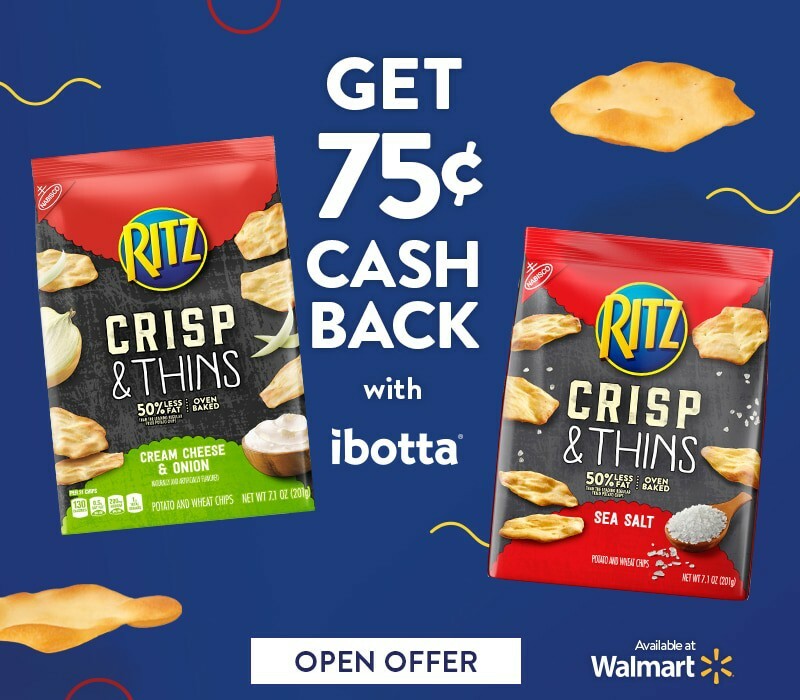 Ibotta is offering a fantastic cash back deal right now when you purchase RITZ Crisp & Thins at Walmart. Simply use the app and purchase one of the following varieties of RITZ Crisp & Thins Crackers for $0.75 cash back! Previous Post: « Playtime with Puppy Dog Pals on DVD and Puppy Chow Popcorn!